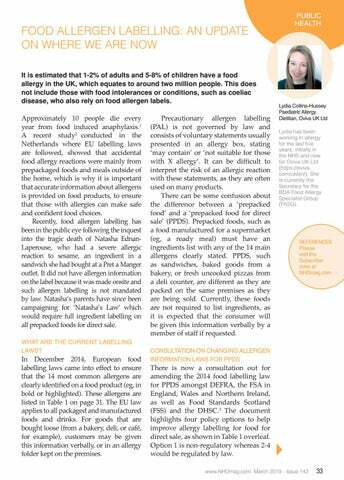 FOOD ALLERGEN LABELLING: AN UPDATE ON WHERE WE ARE NOW It is estimated that 1-2% of adults and 5-8% of children have a food allergy in the UK, which equates to around two million people. This does not include those with food intolerances or conditions, such as coeliac disease, who also rely on food allergen labels. Approximately 10 people die every year from food induced anaphylaxis.1 A recent study2 conducted in the Netherlands where EU labelling laws are followed, showed that accidental food allergy reactions were mainly from prepackaged foods and meals outside of the home, which is why it is important that accurate information about allergens is provided on food products, to ensure that those with allergies can make safe and confident food choices. Recently, food allergen labelling has been in the public eye following the inquest into the tragic death of Natasha EdnanLaperouse, who had a severe allergic reaction to sesame, an ingredient in a sandwich she had bought at a Pret a Manger outlet. It did not have allergen information on the label because it was made onsite and such allergen labelling is not mandated by law. Natasha’s parents have since been campaigning for ‘Natasha’s Law’ which would require full ingredient labelling on all prepacked foods for direct sale. WHAT ARE THE CURRENT LABELLING LAWS? In December 2014, European food labelling laws came into effect to ensure that the 14 most common allergens are clearly identified on a food product (eg, in bold or highlighted). These allergens are listed in Table 1 on page 31. The EU law applies to all packaged and manufactured foods and drinks. For goods that are bought loose (from a bakery, deli, or café, for example), customers may be given this information verbally, or in an allergy folder kept on the premises. Precautionary allergen labelling (PAL) is not governed by law and consists of voluntary statements usually presented in an allergy box, stating ‘may contain’ or ‘not suitable for those with X allergy’. It can be difficult to interpret the risk of an allergic reaction with these statements, as they are often used on many products. There can be some confusion about the difference between a ‘prepacked food’ and a ‘prepacked food for direct sale’ (PPDS). Prepacked foods, such as a food manufactured for a supermarket (eg, a ready meal) must have an ingredients list with any of the 14 main allergens clearly stated. PPDS, such as sandwiches, baked goods from a bakery, or fresh uncooked pizzas from a deli counter, are different as they are packed on the same premises as they are being sold. Currently, these foods are not required to list ingredients, as it is expected that the consumer will be given this information verbally by a member of staff if requested. Lydia Collins-Hussey Paediatric Allergy Dietitian, Oviva UK Ltd Lydia has been working in allergy for the last five years, initially in the NHS and now for Oviva UK Ltd (https://oviva. com/uk/en/). She is currently the Secretary for the BDA Food Allergy Specialist Group (FASG). 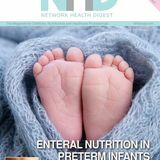 Exploring the latest views about eggs and health Network Health Digest and British Lion eggs have teamed up to find out more about what our readers know about eggs. There are many myths and misconceptions about this nutrient-packed food â&#x20AC;&#x201C; are you up-to-date with the latest scientific thinking? Promote best practice around communicating allergen information to customers. This would not require a legislative change but would continue to support best practice by encouraging businesses and consumers to review knowledge and skills to ensure a safer environment for consumers. ‘Ask-the-staff’ labels on packaging with supporting information available for consumers in writing. Food prepared for direct sale would include a label or sticker on the food advising the consumer to ‘ask the staff’ about allergens. When asked, staff would have to provide supporting information on the 14 main allergens, or provide a full ingredient list. Mandate name of the food and allergen labelling on packaging of PPDS foods. Requires the 14 main allergens to be listed on the product. Mandate name of the food and full ingredients list labelling, with allergens emphasised, on the packaging of PPDS foods. Requires that full ingredients of the product are listed and the 14 main allergens emphasised on the label. Each option has its advantages and disadvantages (see Table 2). The policy is still out for consultation online until the 29th March 2019.4 DEFRA and the FSA are hosting workshops for those living with allergies so that all views can be expressed. WHAT OTHER LABELLING SUPPORT IS THERE?